In the last year, I've learned more about the Spanish Civil War from reading young adult novels than I ever learned in school. First, I read Michelle Cooper's fabulous The Journals of Montmaray trilogy, which worked in details about the civil war through the characters' links to Spain and friendship with a Basque captain (reviews here and here). Then, at the beginning of January I read - almost in one sitting - Lydia Syson's first novel for young adults, A World Between Us, which centres around a love triangle between a nurse, an International Brigades soldier, and a journalist, all fighting fascism in war-torn Spain. Felix (short for Felicity) is a London nurse who follows Nat, a Jewish communist and International Brigades soldier to Spain, out of a sudden, head-over-heels love for him and deep need to escape middle-class, patriarchal suburban life and expectations. George, a family friend who hopes to marry her, follows her when she disappears from the Gare du Nord in Paris and works as a journalist while he tries to discover information about her whereabouts. Introducing these three point-of-view characters, explaining their motivations, and getting them to Spain takes a very few chapters at the beginning of the book, a tricky manoeuvre that felt slightly unwieldy and rushed to me. But once they get to Spain, let me tell you, the novel really gets going. This is the second novel I've read from Hot Key Books's inaugural year. The clever wheel on the back of the book promises 50% epic romance, 25% history, and 25% drama. 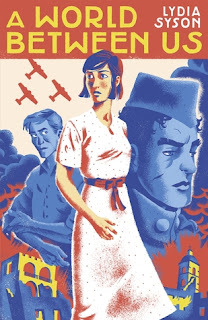 I was a bit worried that the focus of the novel would be on the love triangle, to the exclusion of the fascinating and frankly, really important historical details of the Spanish Civil War, which was in many ways a training ground for the strategies and techniques used in World War II. For instance, the bombing of civilian and not just military targets for the purposes of creating terror. It began with the destruction of Guernica, so terribly evoked in Picasso's famous painting, and repeated itself with terrible consequences in the East End of London, Coventry, Hamburg, Dresden, and many other cities. However, I need not have worried. Syson does a wonderful job of melding historical detail with the lives and loves of her characters. The brutality of the fighting, dealing with bombings, and tending the war-wounded are told compellingly, as is the psychological strain Felix, Nat, and George experience. In a setting like this, the memory of love becomes precious, a place to escape to in a world on fire. The lovers in this novel don't actually spend that much time together. Each character develops over the course of the war and comes to his or her own understanding of the importance of the conflict they are engaged in. These periods of separation also means that moments like the ones in which George sees Felix again or Felix is able to sit with Nat in war-weary Madrid carry heart-breaking significance. Syson deals well with the physicality of romantic relationships in wartime - why wait if you might die tomorrow? What do social expectations matter in world turned upside down? As the novel progresses through the various stages of the civil war, helpful maps at the beginning of each section show the advance of Franco's troops and the major centres where the action takes place, so that you can see just how far away the characters are from each other at any given time and how close they are to the front line. Felix's experiences as a nurse, sometimes in haphazard, ad hoc conditions, are especially well done. As a Canadian, I was so pleased to see that one of our national heroes, Dr. Norman Bethune, has a walk-on role. Shamefully, I had not realised that Bethune pioneered a system for blood transfusions at the front during the Spanish Civil War. The details of blood types, the importance of refridgeration, and the sacrifice of the doctors and nurses who gave their own blood to save their patients are all skillfully rendered. Syson also does an excellent job at hinting at the divisions and suspicions within the anti-fascist faction. George Orwell went to Spain to serve, only to flee with his wife when the communists accused him of being a Trotskyite. The author also illustrates the conflicts between the communists and the Catholic Church, showing the reader that the political, religious, and military situation in Spain was complex and multi-faceted. As the novel drew to a close, I became so engaged with the characters that I found myself throwing out any aesthetic expectations of a balanced ending, only hoping for the characters' happiness in the face of tragedy and barriers at every turn. I'm happy to say that the novel ends the right way (notice, I'm not saying how it ends, or what "right" means). Any personal happiness the characters win at the end comes at the cost of their experiences in Spain and also the inescapable fact of failure and impotence. If you know the history going in, you know that the Spanish communists and International Brigades were defeated and Franco governed Spain until his death in the 1970s. What I hadn't realised until the Afterword is that the international volunteers were actually sent home in 1938, unable to fight until the bitter end. And more problems waited for them at home. International volunteers were seen as suspect because of their relationship with communism and some were not allowed to volunteer as soldiers in the Second World War because Western governments were concerned about their loyalty. Some people had trouble gaining employment after returning from Spain. Volunteers also weren't recognised as veterans until long after the conflict as well. If you enjoyed Elizabeth Wein's Code Name Verity or Michelle Cooper's Montmaray books and are looking for another fabulous YA historical novel, I heartily recommend you pick up A World Between Us. P.S. Last year, a bunch of old interviews with Canadian volunteers in the Spanish Civil War were discovered in the basement of the CBC building in Toronto. Material from these interviews featured on three episodes of the program Living Out Loud. You can listen to them on CBC's player here. Fascinating stuff.